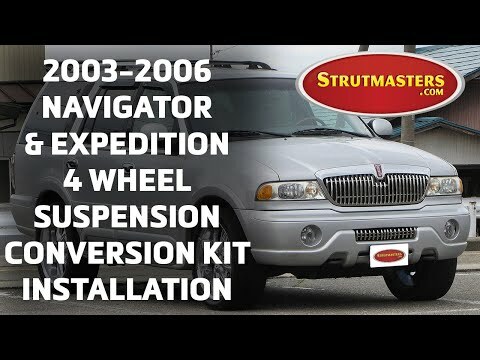 This Premium Suspension Replacement System, available exclusively from Strutmasters, will bring a swift and final end to all of your air suspension problems with your 2003-2004 Lincoln Navigator. 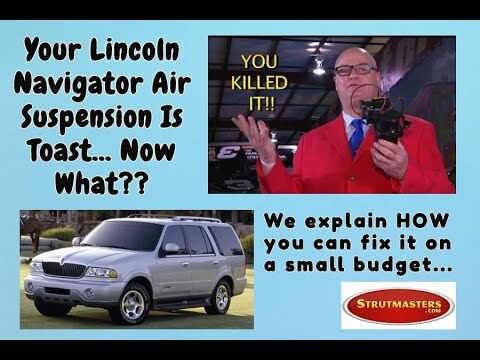 With this product, you can install a brand new passive suspension replacement system on your ENTIRE Navigator for less than the cost of replacing just ONE of your air struts at the dealer. 2003-2004 Lincoln Navigator Premium 4-Wheel Air Suspension Conversion System With Module FX24FM is the perfect solution to your air suspension problems. Designed to be very affordable, you can convert your air suspension to use standard. When your 2003-2004 Lincoln Navigator air suspension system goes bad, you can either continue to take it to the dealership, or you can fix it once and fix it right. At Strutmasters, we have seen how the dependence on a complex network of interdependent parts can lead to constant air suspension headaches. That's why we created this product to eliminate the dependency on all those expensive air and electronic suspension parts that are prone to fail. Our product includes four completely assembled coil-over struts that bolt right in the same place as the original struts with no modifications needed. The result is a ride quality closer to the original system than any other conversion product on the market. Strutmasters designs our product with the Do It Yourself customer in mind. If the installation instructions and guide aren't enough, watch our installation videos on our YouTube channel or call one of our in-house technicians for assistance. We use high quality components and American-made premium steel coil springs, yet offer the product at an incredible value. Let's take a look at the price difference between replacing air suspension vs a passive suspension conversion kit. Now we are going to compare three prices: The price for repairing your air suspension system with OE parts at the dealer; the price for installing aftermarket air suspension parts on your vehicle; and the price of getting rid of the air suspension heartache by installing a brand new coil-over suspension conversion system. 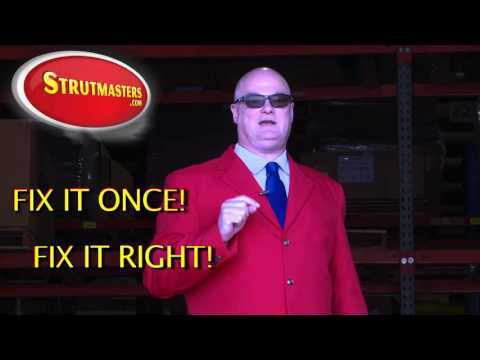 You will soon see why many customers choose Strutmasters over every other option. 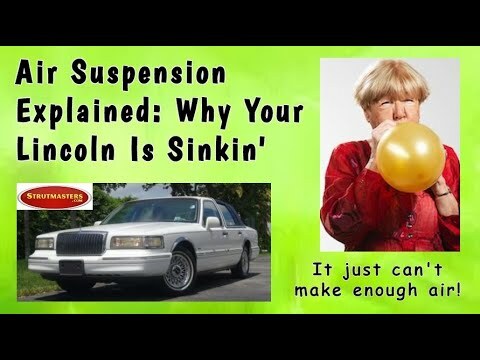 Be on the lookout for common signs of a failed or leaking air suspension in your 2003-2004 Lincoln Navigator. The most obvious of those is a sudden drop of three to five inches of ride height in any of the wheels or noticeable difference in ride height between different sides of the Navigator. 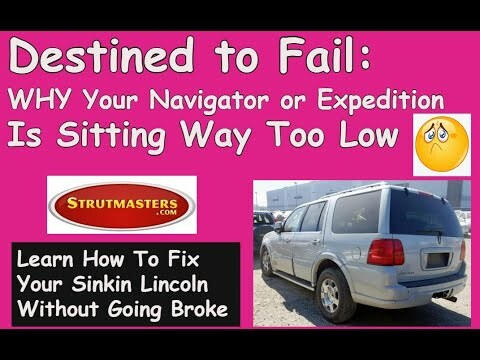 You may experience sagging in the rear or front or an overall appearance of the Navigator squatting down lower than usual. These are all tell-tale indicators of suspension failure. When this occurs, it's common for the air compressor to cease working or run way too often (it will be loud and noisy). Other components may wear out. Your Navigator's ride height should remain consistent. If it looks like it's been slammed to the ground, it's well past time for a repair. This situation is not only uncomfortable, it is outright dangerous. Don't waste time getting your suspension repaired. + Struts ($460/strut) + Air Spring ($520/air bag) + Compressor and Dryer Assembly ($720) = TOTAL: Over $4,600 (and that doesn't even include replacing electronic components that are known to fail such as the height sensors). + Front Air Strut Assemblies ($699.00/pair) + Rear Air Strut Assemblies ($769/pair) + Compressor ($200) + Dryer Assembly ($40.00) = TOTAL: Over $1,700 (and that still doesn‚Äôt include replacing electronic components that are known to fail such as the height sensors). 2003-2004 Lincoln Navigator Air Struts (x4)- The hydraulic fluid-filled struts connect to each wheel and contain a perch upon which rests an air spring. Instead of a mechanical spring, these "air springs" use pressurized air to hold the vehicle off of the wheels and cushion the ride. These air sacks are by far the leading cause of all air suspension leaks. The hydraulic portion of the struts themselves help dampen vibration and control ride ride quality by reducing bounciness. If the vehicle has over 80,000 miles, it is likely the hydraulic strut itself is worn out, too. 2003-2004 Lincoln Navigator Height Sensors (x4)- These small linkages can be found next to each wheel of your Navigator. They are constantly monitoring the height of the vehicle at each wheel and sending that information back to the suspension control module. These components are one of many in air suspension that inevitably wear out with age. 2003-2004 Lincoln Navigator Air Lines- These tubes transfer pressurized air from the compressor to the air springs. This air is what is used to inflate the air springs and hold the vehicle up off of its wheels. 2003-2004 Lincoln Navigator Solenoids (x4)- These L-shaped plastic components work together with the suspension computer to regulate the air pressure in each air spring on your Navigator. As they get older, they will start to leak, causing other components in the air suspension to pick up the slack and¬†start to deteriorate much more quickly. 2003-2004 Lincoln Navigator Compressor- The air in the air springs is generated by the compressor using mechanical force. This compressor also pumps that air into the rest of the system. Once components like the solenoids or air springs start to leak or fail, the compressor usually responds by working harder. This will, in turn, lead to early failure of the compressor, one of the most expensive components in an air suspension. 2003-2004 Lincoln Navigator Dryer Assembly- The dryer is essential to the health of the air suspension system. It removes moisture, which can damage the air suspension components from the inside out. It is usually replaced along with the compressor. 2003-2004 Lincoln Navigator Suspension Control Module- This small computer manages the diagnostic functions of the air suspension system and also uses information from the ride height sensors to maintain your Navigator's correct ride height. 2003-2004 Lincoln Navigator O-rings- These rubber o-rings maintain the seals where the air lines connect. This ensures that the system is both clean and efficient. They should be replaced whenever the air suspension is serviced. This is a nicely designed, high quality kit with Eibach springs – one of best made US brands. Installation was straight forward in terms of procedure, but I have some lessons learned as noted below. I have a 2004 Navigator in excellent condition. By all means, watch the Strutmaster YouTube install video. I’m very satisfied with the ride height after install; if the springs settle a bit after time, will not be an issue. Ride character after install is pretty much same as with air springs – most drivers will feel no difference. Only the most discriminating will note a bit of harshness “at the margin”, ie, abrupt road surface roughness. I count myself as discriminating and am very satisfied with ride. Air springs are softer overall, but this set up is great. Tools/materials I found useful are a 3/8” or preferably ½” ratcheting wrench with metric socket heads and a hollow tube handle extender bar, penetrating oil, an 18”-24” crow bar to lever the attachment point for the bottom end of the struts during install, a hammer, and of course jack stands for safety. I found a 30mm socket head necessary for removal and install of the large bolt securing the bottom end of the strut, as well the hammer to pound this pin out and back in during removal and install. I found the 15mm socket head most useful for other bolt heads in the assembly. Most people don’t have the 30mm size head; despite have a great tool set, I did not have this large size and had to purchase it. I recommend spraying the strut bottom end bolt head and nut with penetrating oil once removing the tires – let that sit for 15-30 min before unbolting, while doing other disassembly work. One of those bolts was particularly difficult to loosen and I struggled with it for some time. An impact wrench would have been useful; I banged on it with a hammer for a bit, which didn’t seem to help. In the end it was just brute force, and using a hollow tube handle extender. (An 18”-24” hollow tube to slip over the ratchet wrench handle, extending it and giving more leverage. Heavy gauge aluminum, steel or even a lead plumbing pipe will do.) My Navigator is a California car with mild weather elements; elsewhere that bolt assembly might have been more difficult. The strut top end nuts have nylon locking rings, so are not hand turnable to a great extent. For the front shocks, I was able to reach down through the engine bay with about 12” of socket wrench extenders to make removal and install easier. For the rears, with very small working spaced, I had a swivel-head type ratchet wrench which made install easier – either way, securing those nuts took some time and patience. I did the install as a two-person team and recommend it. Install was 3-1/2 hours start to finish for all 4 corners, including time to run out and purchase the 30mm socket head. We worked both left and right sides of the install in parallel, and helped each other with 4 hands when necessary – particularly when aligning the strut bottom end for install. The above experience would have been useful for me in preparing for the work. I’m not a mechanic but have good mechanical aptitude. Luckily I have access to an extensive tool set – without that, the above notes would have been essential. Hope this helps future buyers. Very happy with the Strutmaster kit. High quality components and fit. Great ride as replacement for air suspension. Will last a lifetime with no maintenance. Highly recommend it. And kudos to Strutmaster staff being knowledgeable, friendly and polite. I had an air bag with a leak in my Navigator and had already replaced the compressor a year or two ago. Rather than spend money on a new air bag, I decided to convert my vehicle with the Strutmasters kit and do all 4 of the springs. I watched a few videos and read the tutorials and have quite a few tools and luckily enough have an auto lift in my own shop. I am not a mechanic, but am fairly mechanical when it comes to working on vehicles. I know they say, “if you can change brakes, you can install the struts”. I would say that is fairly true. Overall, it took me a total of 8 hours to convert all 4 shocks and wire the module. While it certainly wasn’t bolt out and back in, the install wasn’t too bad. One of the reasons it took longer was because I needed to go to an auto parts store and get a spring compressor to get the new shocks to fit. I wasn’t expecting that and it certainly wasn’t in the instructions. I ended up having to compress 3 of the 4 springs for install and I would assume others have bumped into the same problem. Wiring the module to turn off the air suspension warning light was fairly simple. A little awkward because of the wire locations, but it took me about 30 minutes to wire up and now everything works without having a warning light. A GREAT benefit to the Strutmasters product. Perhaps Strutmasters could consider sending their products already compressed to make installation even easier. I know many coil over products come compressed which makes it much easier to install. Outside of that, install was pretty simple and just takes some patience. They’ve been installed for a little over a week now and they have increased the ride height of my Navigator a bit over the air suspension, but not bad and it actually looks better. They ride nice and have seemed to already soften a little from when I first installed. I think they will settle very nicely and improve the ride quality overall. Overall, I would definitely recommend Strutmasters over comparable products. The quality is great, instructions to install is good and the customer service was also excellent. Jason was fantastic he help me in every little detail and even explaining all the problem that might happen before I even ask or even know what to ask. He was very knowledgeable and very wonderful getting everything done and out the door on the same day. He took his time to make sure everything was there and if I had any other problems, also gave me his number and recommended me to give our mechanic the number if anything might come up so they can call to fix the issues. In the end, it was very easy and smooth talking to Jason I will definitely recommend this to my friend if they want to order anything in the future. Donielle has been wonderful over the past week assisting me!!! Her pleasant personality and awesome customer service has calmed my nerves. I’ll definitely recommend friends/family to STRUTMASTERS!!! Special thanks to Jason for assisting me today. He completed my order in record time and was a pleasure to work with. The conversation with Jason helped me decide the correct shocks for my navigator, and no more check suspensions issues with the light out module.